​Whereas an iconoclast attacks cherished beliefs, an apostate merely turns their back on beliefs they once held. While that’s an apropos descriptor for what goes on in Washington D.C. on a regular day, it’s also the other half of the recent collaboration between Barrel of Monks in Boca Raton and Boynton Beach’s Due South Brewing. Iconoclast was the beer brewed in Boca. I reviewed that a few weeks ago. Today, we look at the Boynton entry, Apostate (Belgian IPA, 6% ABV, 54 IBU). 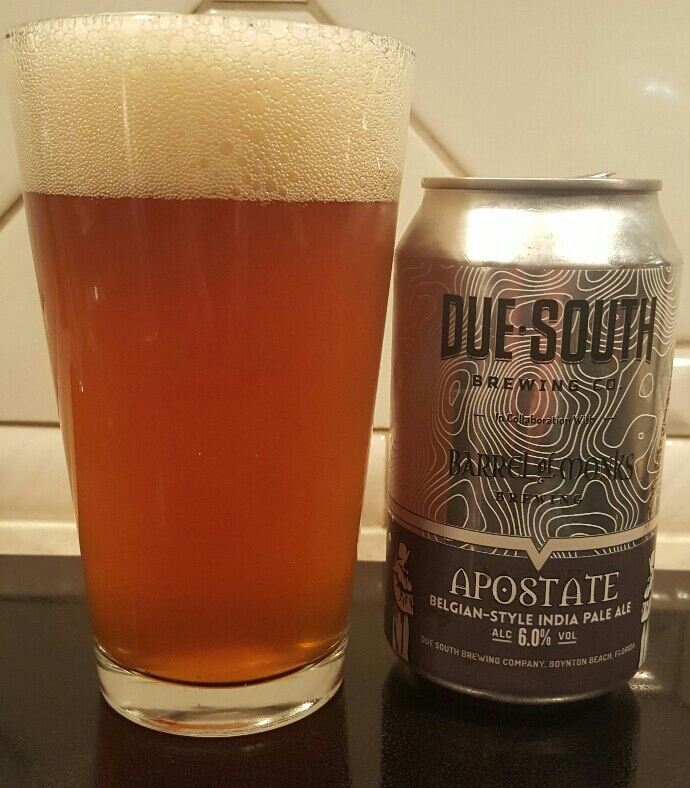 It starts life as a Belgian Pale, and (according to the can) is hopped enough to give it the signature Due South fingerprint. And what ensued was one of the most interesting battles on my tongue that I’ve had for some time. It starts off with those signature hops, big and brassy with a clean citrus flavor. But not too long afterward comes a sweet, bready Belgian flavor, championed with what feels like Barrel of Monks’ house strain. It was quite something to taste the hops and that gorgeous malt/yeast combination go at it. Both are intensely flavorful and it brings an added dimension to what I expected to be a good beer anyway. Apparently it’s good to turn your back every once in a while. Celebrate Florida Craft Beer Day on Feb. 15th! Follow Florida Beer Blog on Instagram! The one on the bottom is Manny, co-owner of the ever so creatively ran @descargabrewing. Trust me when I say you want to try their beers, and you can do so at @soflotacobattlecraftbeerfest this Saturday! If you want to know what they're bringing, however, listen to the current episode of the Florida Beer Podcast, available everywhere you get your podcasts!